This is an easy walk along the beach which has hard sand and so walking is easy. The route begins from a carpark on William Street beside a small stream (which is popular with Whitebaiters at the appropriate time of the year). There is a toilet in the carpark beside the bridge. There are beach access points every few hundred metres as you walk along the beach north from Waikanae Beach for about 1 km. There is about 2 km and then the beach access points are marked again as you approach Peka Peka. The beach access points are prominent blue poles. 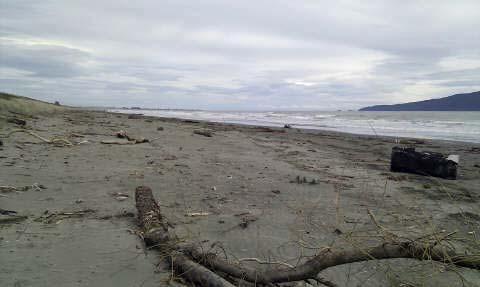 Vehicles can use the beach near Waikanae, and horses may also be present on the beach. It is a flat and easy walk of about 4 km from Waikanae Beach to Peka Peka. Peka Peka Road ends at the beach. At this point you can return along the beach to Waikanae, or head up Peka Peka Road and then right on to Paetawa Road for a loop trip back to Waikanae. Although this is an 80 km/hr road it is a pleasant route. For cyclists, this is part of the Waikanae Coastal Cycle Route and there is a gravel track in places off the main road. This cycle track goes inland away from the main road near the oxidation ponds. As you approach Waikanae Beach turn left from Rutherford Drive on to William Street, and in another kilometre you are back at the carpark. Allow 2 hours for the round trip. Waikanae Beach is best reached by car. There is a good carpark at the start of William Street. Take Te Moana Road from SH1 at Waikanae towards the coast. Turn right on to Ruaparaha St and then right again on to Huiawa St. Follow this for about a kilometre until it goes round a 90 degree bend and over a small bridge. This is the start of William St and the carpark and toilets will be on the left. Vehicles are allowed to access some parts of Waikanae Beach near the William St carpark. Cycling is possible (and popular) along Paetawa Road between Peka Peka and Waikanae beach. A Cheeky Monkey production, choice bro!